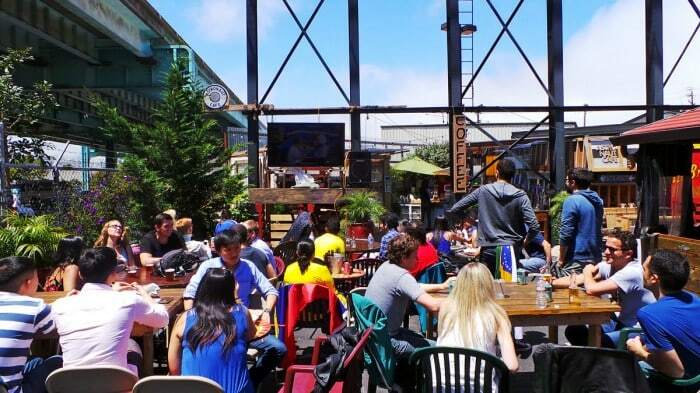 If you’re looking to watch the World Cup in San Francisco you’ve certainly got plenty of options. In my mind, the most obvious two would be at home if you want to watch alone or at a sports bar if you want to watch in public. 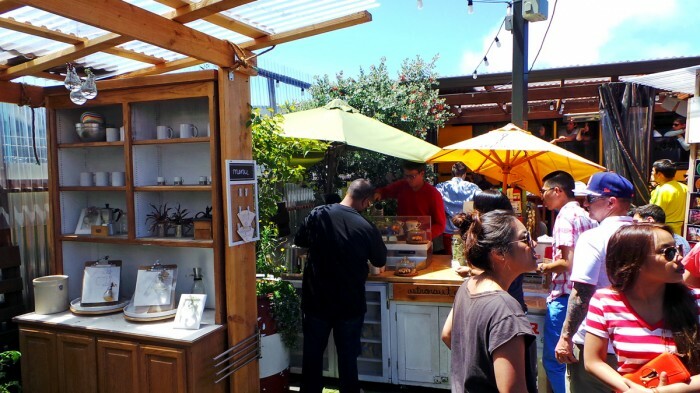 But if you’re looking for something a little different and also want a variety of unique food options and even more importantly want to be outdoors, read on! 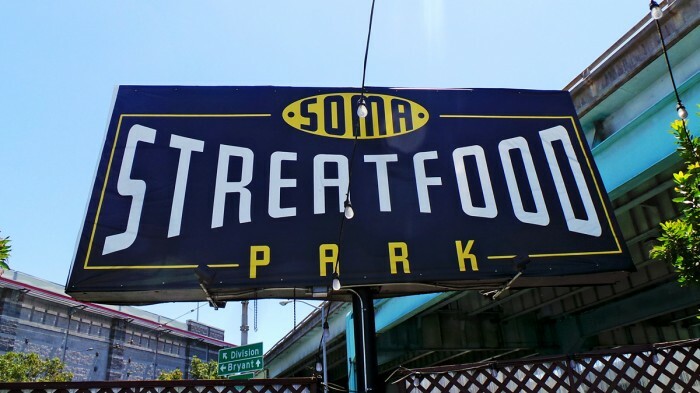 In the shadow of both a highway and a gigantic Costco, in a remote corner of town that could barely still be called SoMa, there’s a really incredible place worth trekking to called SoMa StrEat Food. 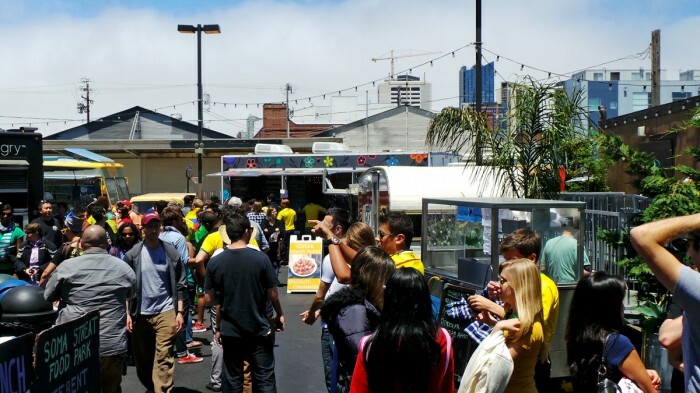 It’s a large, triangular outdoor lot that draws plenty of young, hip yuppies for food, drink, and various forms of entertainment. 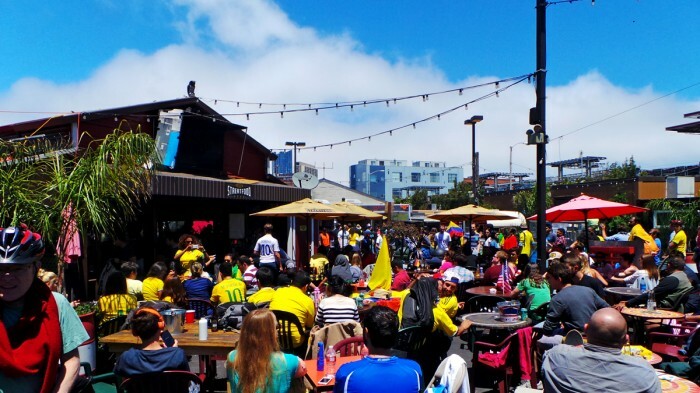 They host many fun activities on most days of the week such as Trivia Tuesday and Friday Night Comedy, but have also been hosting large World Cup viewings on their many large, flat-screen TVs hung throughout the outdoor space. 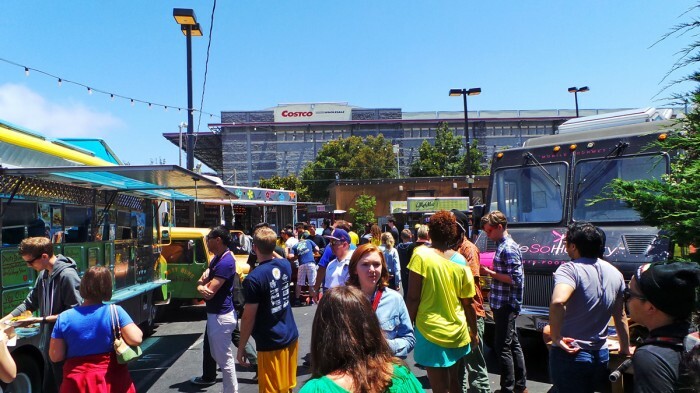 The events always feature a revolving cast of ethnic and hipster food trucks which serve awesome bites to munch on while hanging outside. It’s a pretty awesome space with a lot of personality but it definitely fills up quickly. 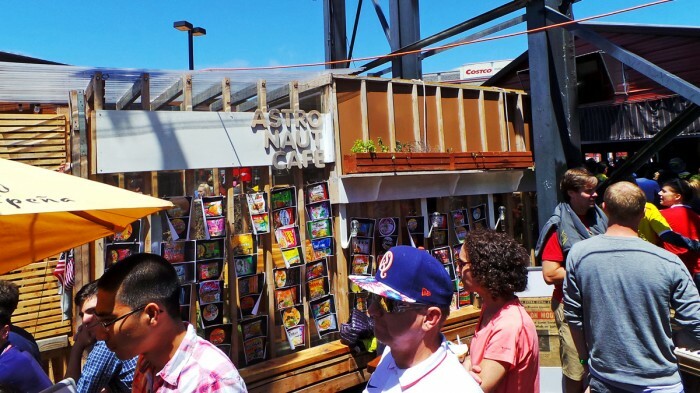 As is always the case, where there are crowds, there are lines — especially for booze. And if it wasn’t painfully obvious from all the yellow in my photos, I stopped by during a Brazil World Cup game. 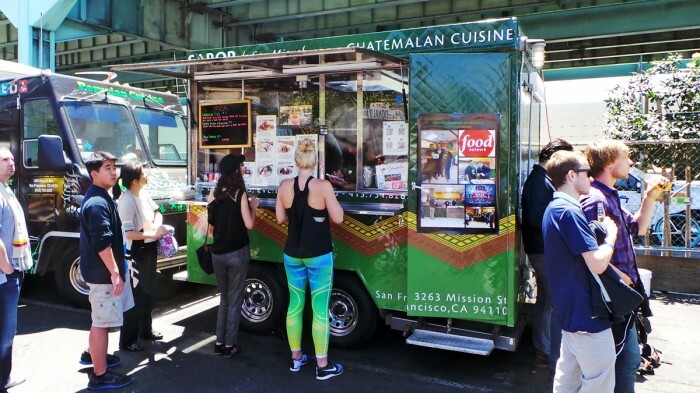 With so many food truck options, I’m not sure exactly what drew me to the petite Sabor de San Miguel cart. Perhaps it was because the lines were not as long as many of their competitors or the fact that there was next to nothing written about them online, but I knew I had to give them a shot. 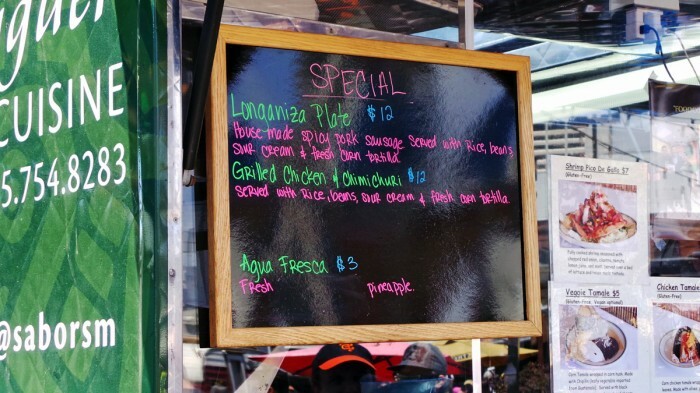 Especially once I caught a glimpse of the specials board which listed a Guatemalan Longaniza Plate. Like I’ve been saying over and over and over and over and over again, I’ve become pretty obsessed with sausages and am always hunting for new, interesting varieties. I’d never had Guatemalan sausage before so I knew I had to go for it. At $12, the plate wasn’t cheap, especially for street food, but the portion was massive so it was totally worth it. 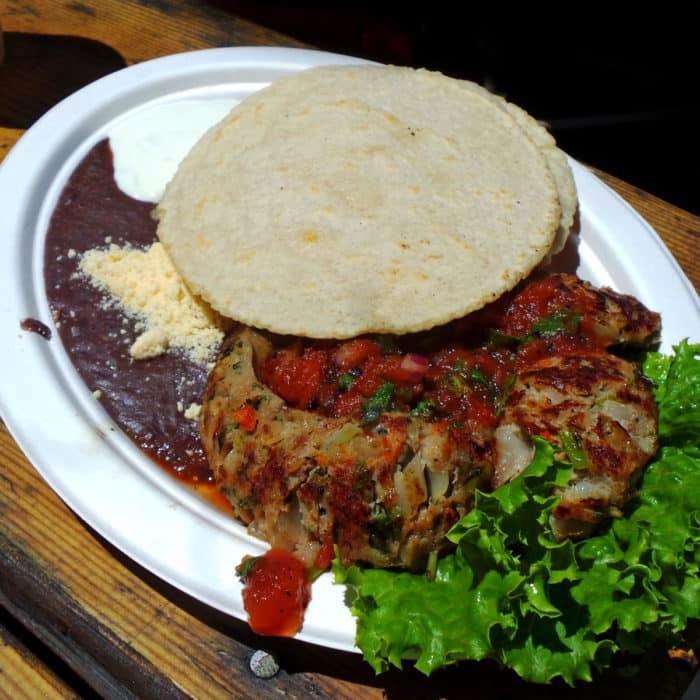 The platter came with a mound of nicely seasoned rice, black beans, crema, two thick fresh tortillas, and four or five halved links of grilled sausage drizzled with chunky hot sauce. To eat it, I loaded a bit of each element into the tortillas and made myself taco-like sandwiches. And they were extraordinary, mostly due to the delicious longaniza sausage. The veggie and rice studded links had a really unusual chunky texture that I kind of fell in love with. Every bite was incredible and the peppery heat really crept up on me by the end. At halftime I decided it was time to explore more food options, but by this point, the place was packed. 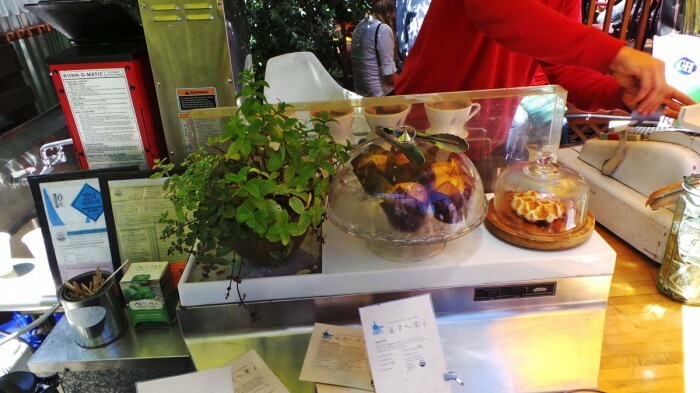 Every truck had long, snaking half-hour lines so I bailed on that thought until I stumbled across a more permanent fixture of the park, Astronaut Cafe. For some reason this non-mobile coffee shop did not draw the same kinds of crowds as the rest of the places, but that didn’t stop me. Since it was a hot, sunny day I figured one of their artisanal gelato popsicles would really hit the spot and help cool me off. 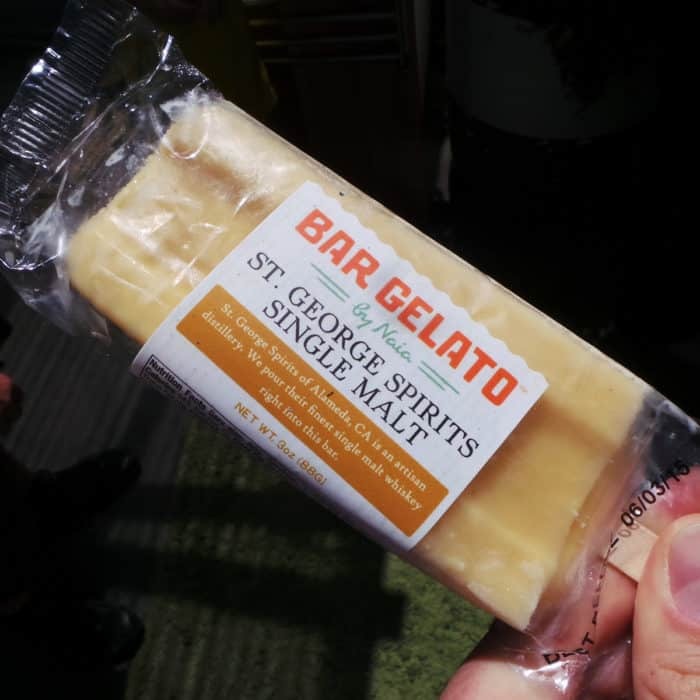 There were a variety of interesting sounding flavors, but I couldn’t resist the St. George Spirits Single Malt flavored one. 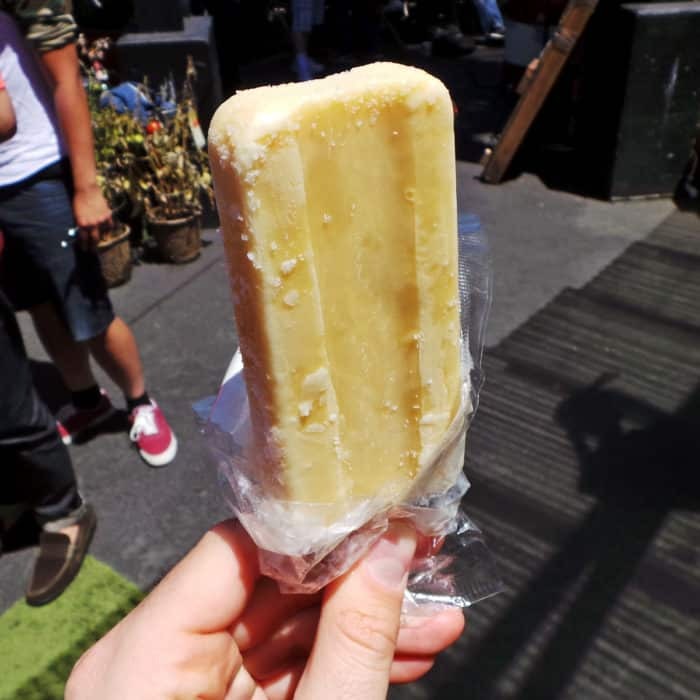 Yep, a whiskey flavored popsicle — evil and twisted. It was really delicious and super refreshing, though I didn’t taste too much smokey whiskey flavor like I was expecting. It tasted more like creamy caramel, which was really great in its own right even though it didn’t really live up to its whiskey name. 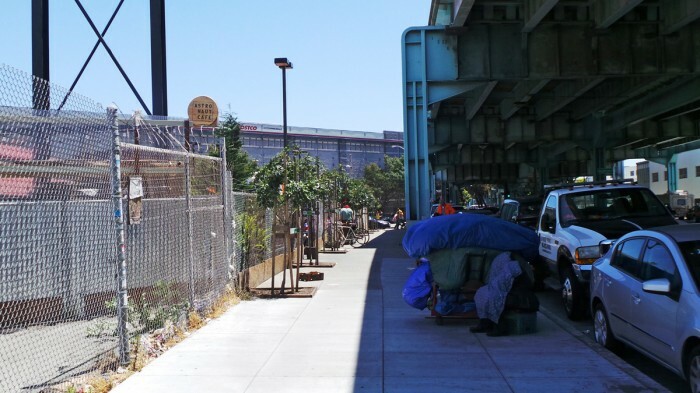 I also took the opportunity to to get some Blue Bottle Coffee for a needed jolt of caffeine. The pour over coffee was fantastic, but I’ve already written at length about that. So, I drank my coffee and ate my gelato bar as the game concluded and Brazil defeated Colombia. I went wild for food while crowd went wild for their own reasons. 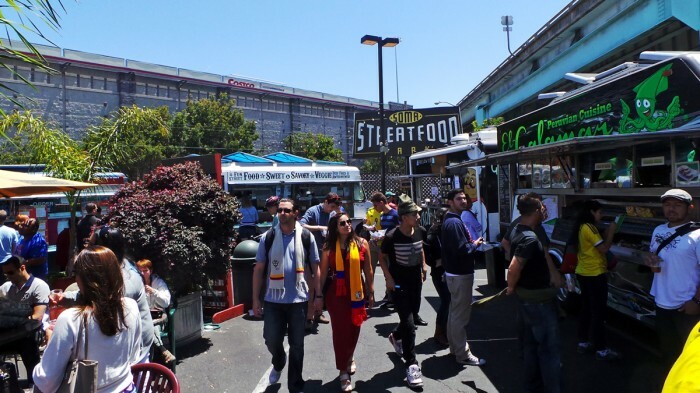 Whether it’s World Cup season or not, I’d highly recommend trekking over to the SoMa StrEat Food festival any day you feel like eating or drinking outside. There’s always fun activities going on and there’s sure to be something exciting to eat while you’re at it. 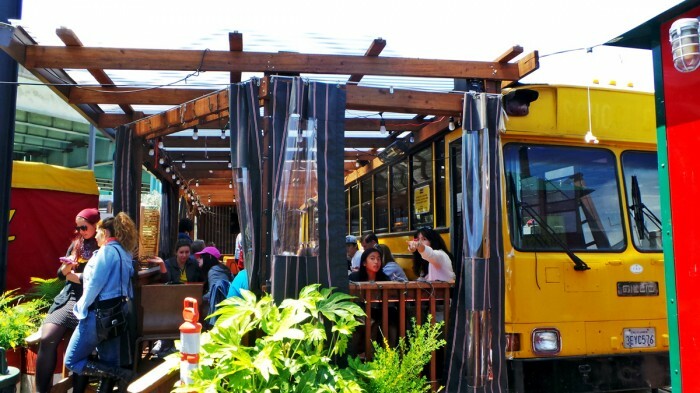 Got another interesting place to eat or drink outside in SF? Let me know in the comments below.